Recently forage-testing laboratories have begun to evaluate forages for neutral detergent fiber (NDF) digestibility. Evaluation of forages for NDF digestibility is being conducted to aid prediction of total forage digestibility. There are several important reasons why forages are being evaluated for NDF digestibility. Third, forage digestibility is calculated in the 2001 Nutrient Requirements of Dairy Cattle (NRC) using a summative approach where energy contributed from protein, fat, non-fiber carbohydrate (NFC) and NDF are summed. A prediction of NDF digestibility is required to use a summative energy prediction for forages. This Focus on Forage will discuss the concepts and methods of NDF digestibility and how it is being used in the dairy industry. How is NDF digestibility measured? Forage NDF digestibility can be measured in one of two ways. With the in situ method, forages are placed in small dacron bags and then inserted into the rumen of a cow through a ruminal cannula. The amount of NDF prior to ruminal incubation is compared to the amount of NDF remaining after ruminal incubation and NDF digestibility is calculated. The in situ method is a very good method to estimate NDF digestibility of forages and is often used in research and other forage evaluation programs. However, the 2001 NRC does not use the in situ method as its basis for NDF digestibility of forages because a large uniform database does not exist. Forage sample is weighed into a glass flask. Buffers, macro and micro-minerals are added along with rumen fluid extracted from a cow fit with a ruminal cannula. The forage, buffers and rumen fluid are incubated in a water bath in an anaerobic environment (carbon dioxide) at a cow’s body temperature (102°F) for 48 hours. 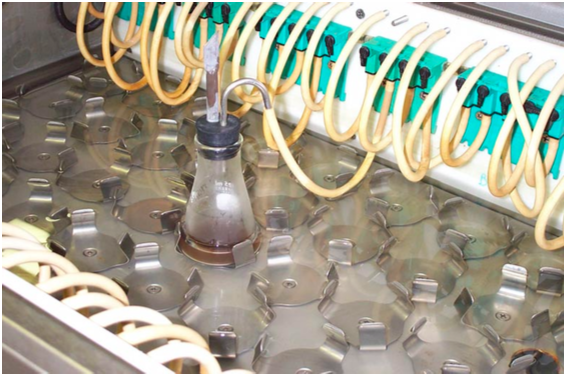 The flask containing the forage sample, buffers and rumen fluid is removed from water bath and the remaining solution is refluxed in NDF solution for 1 hours. After refluxing in NDF solution for 1 hours the remaining solution is filtered and the NDF that resisted digestion by rumen bacteria is retain on the filter. Digestible NDF is calculated by difference. The in vitro assay described above is commonly called in vitro true dry matter digestibility (IVTMDM) and was developed by Goering and Van Soest, 1970. Few changes have been made to the in vitro assay over the years but some researchers and laboratories have reduced the incubation times from 48 hr to 30 or 24 hr, claiming that shorter incubation times better describes the digestion potential of NDF in high producing, lactating dairy cows. Reducing the incubation time of the in vitro assay to 30 or 24 hr is logical because feed is not retained in the rumen of a high producing dairy cow for 48 hr. In the large sense however, this issue is somewhat irrelevant because changing the incubation time of the assay reduces the amount of NDF digested therefore NDF digestibility values obtained from 30 or 24 hr digestions cannot be compared to 48 hr NDF digestibility values listed in the 2001 NRC. Additionally, the digestibility of forage NDF incubated for 24, 30 or 48 hr is highly correlated. Therefore any incubation time point ranks forage NDF digestibility in relatively the same manner. The 2001 NRC uses lignin and NDF concentrations to predict potential NDF digestibility and advises the use of an in vitro system as the basis for direct determination of forage NDF digestibility. This recommendation is made because a large, more uniform database of in vitro NDF digestibility references is available. Perhaps the most important challenge with NDF digestibility at this time is to develop uniform references to NDF digestibility that have a common scale. Because the 2001 NRC uses or advises the use of a 48 hr in vitro NDF digestibility procedure it is most logical to identify with that reference and scale. What is the difference between measuring in vitro dry matter and in vitro NDF digestibility? In reality, there is no difference in the assay methods used to determine in vitro dry matter digestibility and in vitro NDF digestibility. Both values come out of the same in vitro assay described above. As an example, if the assay starts with 1 gm of dry matter and, after incubation and filtration, there is 0.2 gm of indigestible NDF left on the filter then 80% of the dry matter was digested. If the assay started with 1 gm of dry matter that was 40% NDF then the assay started with 0.4 gm of NDF. Again, if 0.2 gm of undigested NDF remained on the filter after incubation and filtration, then NDF digestibility would be 50% of the NDF. In vitro dry matter and NDF digestibility can be converted to one another by the following equations. 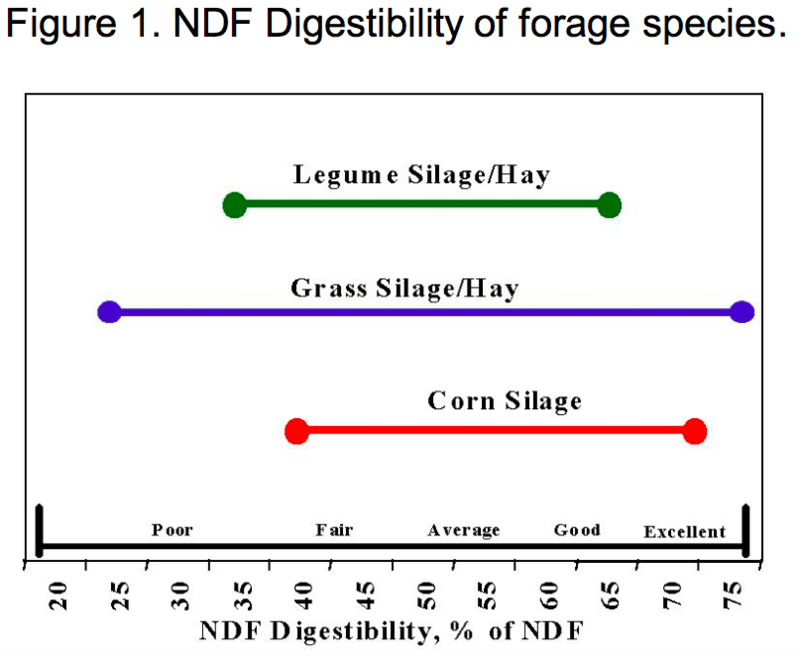 What are average NDF digestibility values for various forages? First, it is very important to remember that total NDF content of the forage is still a dominant factor in determining overall forage quality. For example, a forage that contains 40% NDF is generally of higher quality than a forage that contains 60% NDF. Differences in NDF digestibility between common forage species are presented in Figure 1. In general legumes have less total NDF and lower NDF digestibility due to greater lignification as compared to grasses. Grass silage and hay have a very wide range of NDF digestibility because grass species are so diverse and are utilized at extreme ranges in maturity (e.g. grazing vegetative grass versus feeding straw). Corn silage can have a wide range of NDF digestibility but it is uncommon to see the extremes because corn silage is harvested and stored within a relatively narrow range of maturity. Extremes in corn silage NDF digestibility can occur when corn silage is harvested at an over mature stage (NDF digestibility = low), or when a brown midrib variety is used (NDF digestibility = high). What factors influence NDF digestibility? The primary factor that influences NDF digestibility is maturity. In legumes, NDF digestibility decreases slowly during the first stages of growth (stem elongation). However, when cell and stem diameters increase and the heavily lignified xylem tissue develops, NDF digestibility decreases rapidly. The maturity mechanisms in legumes that reduce NDF digestibility are similar in grasses and corn silage. Plant genetics can also influence NDF digestibility. In corn, varieties with brown midrib genetics are known to have more digestible NDF. Also, sorghum and sudangrass species tend to be more digestible than corn. The plant growth environment can influence NDF digestibility. Generally, plants grown under cooler conditions or in northern latitudes have higher NDF digestibility than those grown further south or under hotter conditions. Within a growing season forages can change as well. Spring growth alfalfa tends to have higher fiber digestibility than alfalfa grown during the summer. Finally, crop management may influence fiber digestibility. For example, high corn plant density results in lower fiber digestibility. What is the influence of NDF digestibility on total forage digestibility? To demonstrate the impact of NDF digestibility on total forage digestibility, consider the following example. Assume that forage #1 and #2 contain 17% CP, 35% ADF, and 50% NDF. The NDF digestibility of forage #1 is 60% and the NDF digestibility of forage # 2 is 40%. In older forage evaluation systems forage # 1 and #2 are viewed as being identical. When NDF digestibility is taken into account forage #1 has 7.5 percentage units more total digestible nutrients (TDN) than forage #2. The additional 7.5 percentage units of TDN could result in 5 lb./cow/day of increased milk yield. Can NDF digestibility be determined using near infrared spectroscopy (NIRS)? Yes, the NDF digestibility equations (NIRS) developed for legume/grass silage and hay can provide reliable estimates of NDF digestibility. Using NIRS to predict NDF digestibility of corn silage has proved more challenging but acceptable equations for corn silage NDF digestibility are now available. Using NIRS to routinely screen for variation in forage NDF digestibility combined with occasionally checking suspect forages with wet chemistry in vitro NDF digestibility procedures is prudent.